After the Pálinka festival at Buda Castle last weekend, we took the metro to Batthyány Tér for crepes. Nagyi Palacsinta (Granny’s Pancakes) is this awesome crepe restaurant with about 15 kinds of savory pancakes and twice as many sweet ones. We ordered two apiece (I got chestnut cream and marzipan cream), but In the days afterward, I was crepe-obsessed. I couldn’t stop thinking about them. So when it was my turn to make dinner again, this is what turned up. They were absolutely delicious, and not at all hard to make, even without a blender. 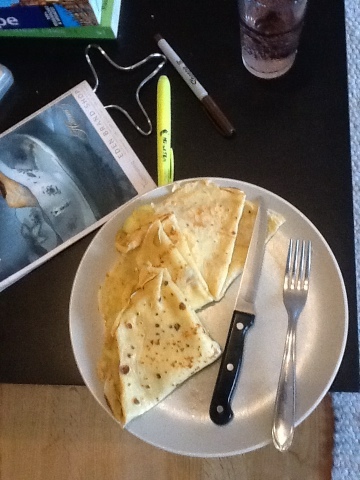 I present here a large recipe–it made enough dinner for three plus extra crepes for breakfast the next morning. They reheat remarkably well in a pan (best) or a microwave (ok) and since the crepes themselves are not savory, they lend themselves as well to nutella as cheese. Stir salt and flour together in a large bowl. In another bowl, beat eggs until they are all one color. Add milk and water and beat together. Pour liquid ingredients into flour mixture and beat with a fork until all flour lumps are gone. (Alternatively, you can put all ingredients together in a blender and blend it up for a few seconds.) Pour in melted butter and oil and stir to combine. Heat a skillet over medium heat and melt some butter, spreading it over the bottom of the pan. Ladle about 1/3 cup of crepe batter into the center of the pan, then tilt the pan to spread the batter out as thinly as possible. Cook until bottom is browned, then flip and cook topside. Keep the finished crepes warm in the oven. When all the crepes are cooked, take one from the oven and spread it out in the pan. In one corner, place a slice of Camembert, a slice of speck, and a slice of apple. 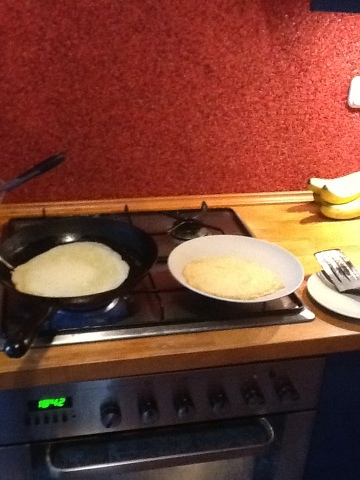 Fold pancake in half and in half again to surround filling. Repeat with remaining fillings and serve immediately. Added this to the must-try list too!